If your mom loves the combination of sweet and savory then she is going to love these sausage stuffed waffles. 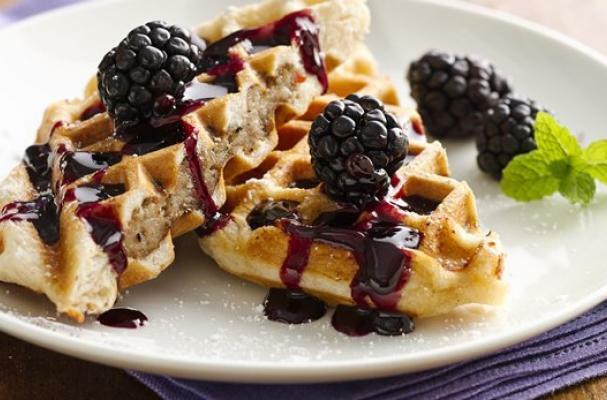 Similar to pigs in a blanket, breakfast sausage patties are cooked in between two waffles and drizzled in blackberry syrup and fresh blackberries. This is a great recipe for the kids to do because it uses refrigerated biscuit dough so all they have to do is spread the dough in the waffle maker. This same recipe can be made with blueberry syrup or raspberry syrup too. For the finishing touch, sprinkle powdered sugar. Step 1: Heat waffle maker. Spray with Crisco® Original No-Stick Cooking Spray. Meanwhile, heat sausage patties in microwave as directed on package. Drain on paper towels. Cool about 10 minutes. Step 2: Separate dough into 8 biscuits. Slit each biscuit on side, forming a deep pocket. Place sausage patty in each pocket. Press edges to seal. Step 3: Place 2 to 4 biscuits in waffle maker; close lid. Cook 4 to 5 minutes or until golden brown. Remove from waffle maker and cover with foil to keep warm. Repeat with remaining biscuits. Step 4: Meanwhile, in 1-quart saucepan, mix jam and 2 tablespoons water. Cook over low heat, stirring occasionally, until smooth and thoroughly heated. 5 To serve, sprinkle biscuits with powdered sugar. Drizzle with blackberry sauce; garnish with blackberries and mint leaves. Serve with remaining sauce.